Lightning never strikes in one place twice, right? Today, I had planned to write a review of yet another book I read, but live proved to be more interesting (and scarier) than fiction. So my house got struck by lightning Friday evening. Never thought I would be able to say something like that… Well, to be precise, it wasn’t a direct hit – the lightning struck the pool in my backyard. That didn’t prevent it from wreaking havoc around the house though. But let’s start from the beginning, shall we? That afternoon, my father-in-law was cleaning the pool and left the pool net (the one on a big metallic pole) propped next to the pool deck. It started raining, so he switched the pool off and went inside. Unfortunately, he didn’t unplug the pump or put the net on the big metallic pole back in the shed. Two hours later our peaceful evening was interrupted by an ear-shattering crack and the loudest bang I have ever heard. It really sounded like an explosion right in our backyard. My thirty pound dog jumped up my lap so fast, it looked like she teleported. My 85-pound German shepherd tried to dig her way under the sofa, but only succeeded in pushing it all the way towards the wall almost knocking herself out in the process. And my two cats relocated under the bed upstairs, and it took me several hours and a can of tuna to persuade them the sky wasn’t falling on us and we weren’t going to die. That is after I finished having my own heart attack. Nope, that’s not a bullet hole, that’s lightning damage. 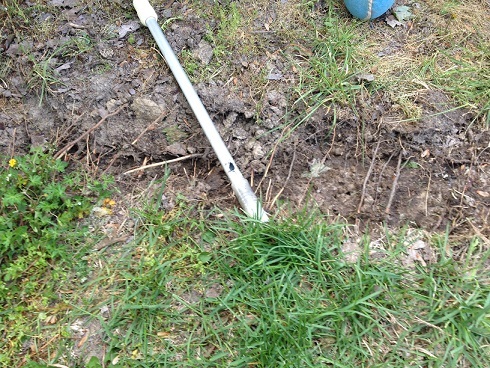 The lightning stroke the pole, scorched part of the deck, dug a trench in the yard from the end of the deck towards the power outlet by the pool pump, and fried the whole pool system. I mean the outlet was so scorched we barely managed to pull the plugs out. And the impact was so intense that that dirt from the trench ended up floating in the pool. It’s an above ground pool with 4 feet tall sides. But the damage didn’t stop there. Through that outlet, the lightning then traveled into the house, melted the circuit breaker that was supposed to shut that circuit off, and did wonders on electric devises. The Direct TV box got so messed up that it literally hang itself and would not reboot. The poor technician spent 5 hours on Saturday trying to make the thing work again. In the end, he had to replace both the receiver and the dish itself. Our TV decided that it had suffered enough abuse and decided to shut down permanently. The sound system still works, but the subwoofer is toast. 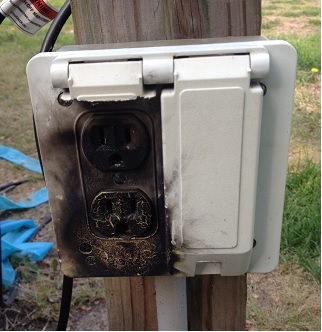 Several electric outlets around the house quit working. Oh, and the cherry on top – my beautiful, less than a year old desktop might as well be a door stopper now. Good news is that nobody got hurt and that our homeowners insurance will cover the damage. So we certainly got the fright of our lives, but the consequences could have been more dire. I also learned a few things from this unfortunate encounter with lightning. First of all, never ever leave a metallic pole outside when it’s raining. That’s just inviting disaster. Secondly, always back up your work. I mean all my writing was on that desktop. So thank God for Google Drive! Oh my word! Glad everything was alright, and everyone was ok! Yes, we were very lucky. Things can be replaced. Just glad everyone is ok, and that the house didn’t burn down.